Although a picture is said to be worth a thousand words, out of respect for your time, here are 290 words about this chart of U.S. stock market performance over an amazing decade. 1. 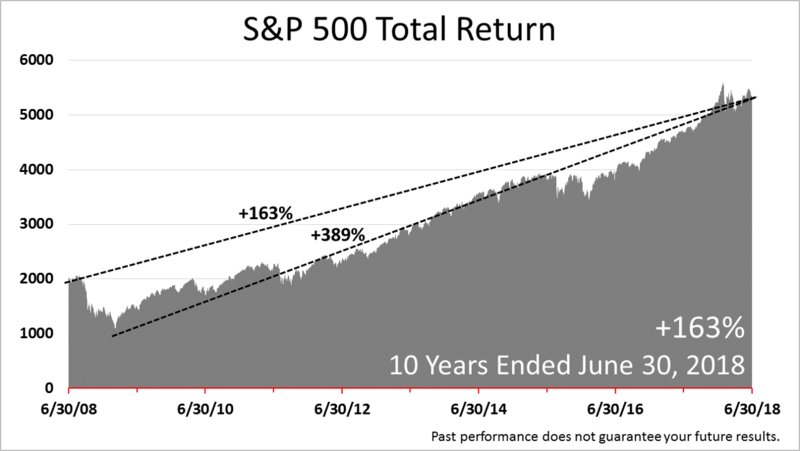 Over the 10-year period ended June 30, 2018, the S&P 500 total return index gained +163%, an average annual return of 16.3%, compared to the average annually since 1926 of 10%. 2. From the financial crisis bottom on March 9, 2009, the S&P 500 total return index through June 2018 gained +389% - an average return in those nine years of 43.2%. 3. In the nine-year bull run, stocks "corrected" - market-speak for a decline of 10% to 20% - four times, and each double-digit setback came in the last five years. 4. An investor with perfect timing predicted the March 9, 2009 low during the bottom of the 40% drop in prices in the bear market of 2008-9, which no one could, and then held for the next nine years, despite four corrections. 5. An investor with the worst possible timing, who put their retirement nest egg in stocks at market peak a decade ago, just before values plunged by 40%, in the decade, averaged a return of 16.3% annually. 6. The Great Recession decline of 40% was one of the worst bear markets in modern U.S. history. 7. Those within five years of retiring are at the greatest risk to bad timing and can be mitigated by strategically allocating assets, which is crucial to pre-retirees. 8. America's 500 largest publicly held companies more than fulfilled their role as the engine of growth in a broadly diversified retirement portfolio. 9. Understanding 10 years of stock market performance requires knowing statistics, but mostly depends on knowing the history of domestic and global financial assets, along with economic fundamentals driving growth. 10. No one can predict the end of a bear or bull market or the stock market's next big move.